I thought it might be nice to start off with an eye-catching photo to help grab your attention. 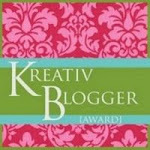 I apologize for the hiatus in blogging, but try as I might to emulate my friends who can blog while they are traveling, I am not able to do so. Not even when I have wifi access and a portable keyboard. That comes from being generally exhausted at the end of the day. 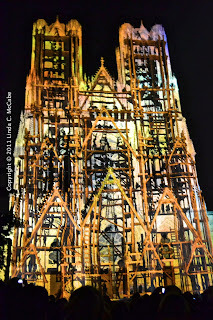 I have a lot of material for my blog about my travels to Milan and Rome in June as well as my trip in July and early August in France, Belgium and Aachen, Germany. 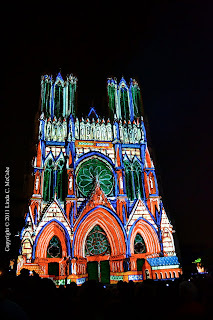 My first post about my trip to France is about the spectacle in Reims to celebrate the 800th anniversary of the cathedral. I wanted to share this with my readers while there is still the opportunity for people to see it. I do not know if they will ever show this spectacle again once it is over. It would be a shame if they did not, but I did not hear plans of their doing it again next year. 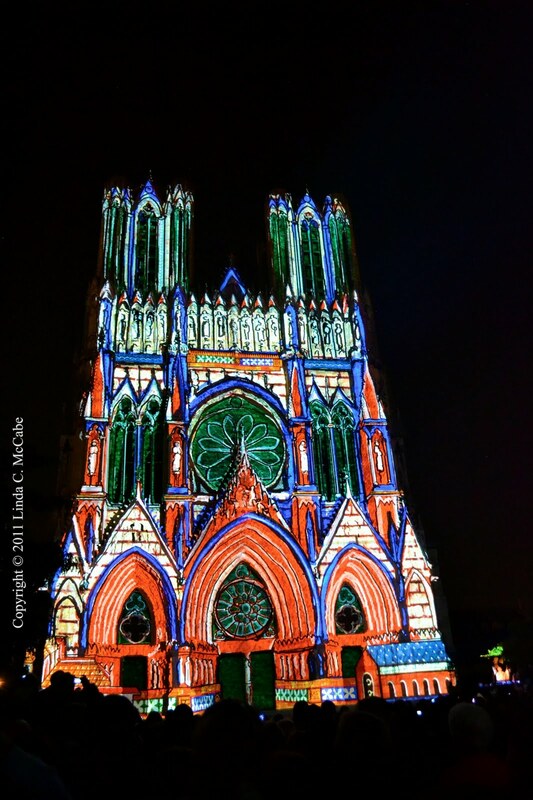 Reims has an amazing light show using high power projecters on the northern façade of the cathedral. These are not mere beautiful lights on the outside of a building, these are images specifically designed for this particular building and all of its numerous sculptures. 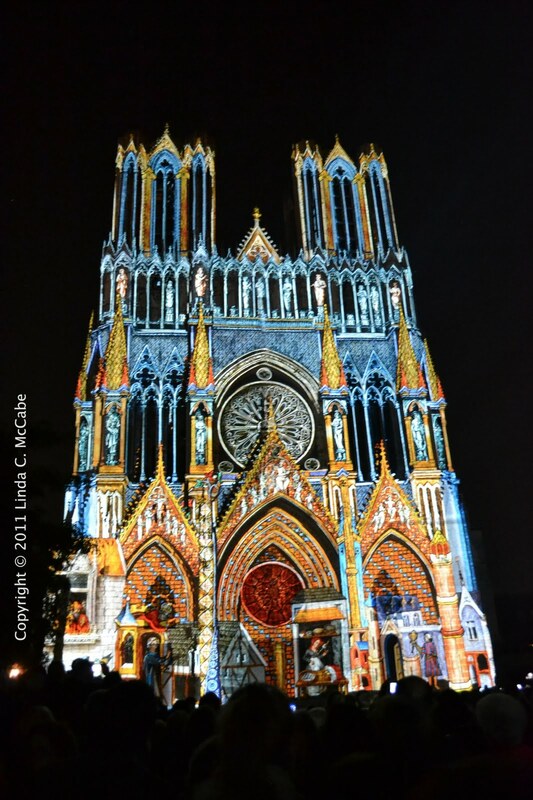 The show premiered on May 6th, on the same day that the cathedral's building began 800 years ago. My husband and I saw it on Saturday, July 30th at eleven o'clock at night. We were there along with thousands of people patiently waiting on the street for the event to begin. 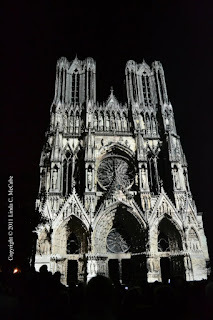 Here is the unadorned cathedral at night. It is beautiful, but nothing like we were soon to witness. As soon as all the lights of the street and surrounding areas were extinguished, the crowd's sense of anticipation grew. We were not disappointed. 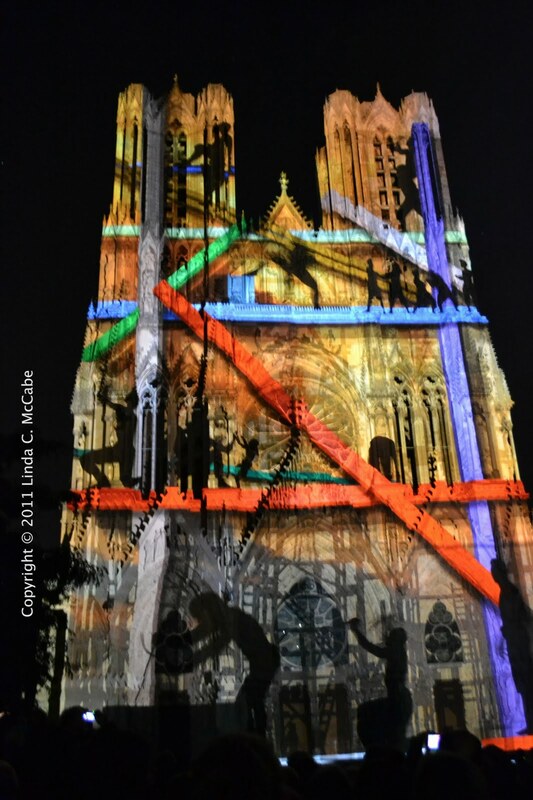 After dazzling us with the side of the cathedral all alight with color, the show shifted to re-enacting its construction. 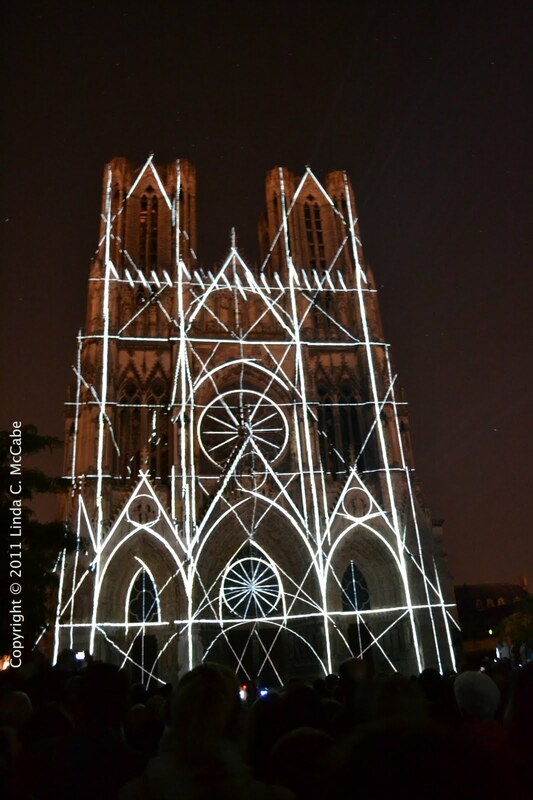 This began with bright white architectural lines appearing on the darkened surface. Then came the scaffolding and the workers. 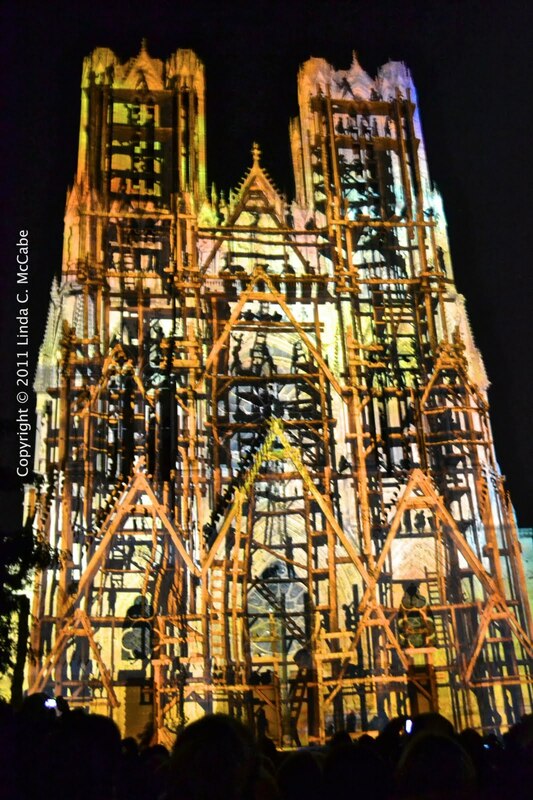 We could even see the workers as they walked along the wood scaffolds and wielded hammers. 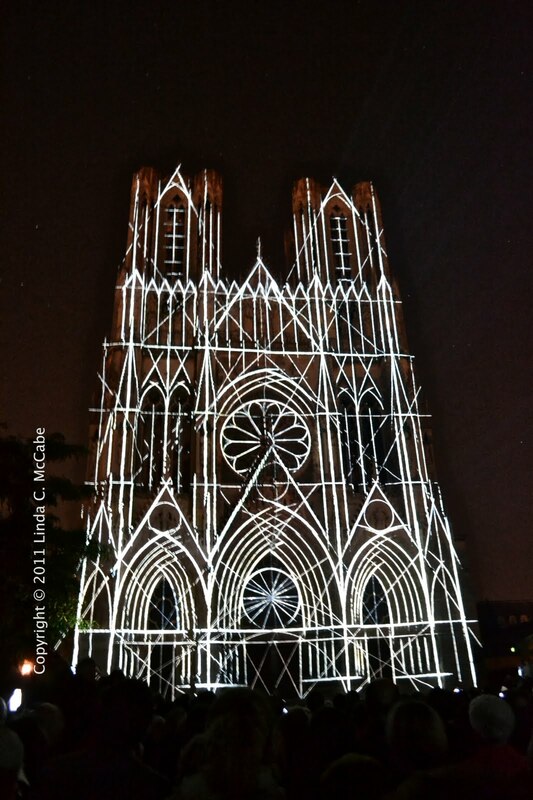 Then this scene transformed into modern dance on the side of the cathedral where generations of French kings were coronated. 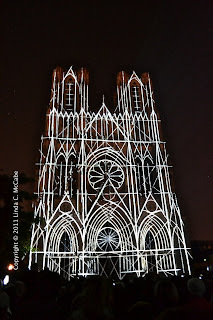 Here are links to the official website for the cathedrale and the office of tourism. The last showing will be Sunday, October 23rd and please note that it is not shown every night of the week. If you are interested in seeing it in person, I recommend contacting the tourist office ahead of time with the your travel dates in mind to make sure that they will be airing this spectacle that night. There is some contradictory information on the different webpages on the remaining show dates and I would hate for someone to travel thousands of miles and be disappointed. 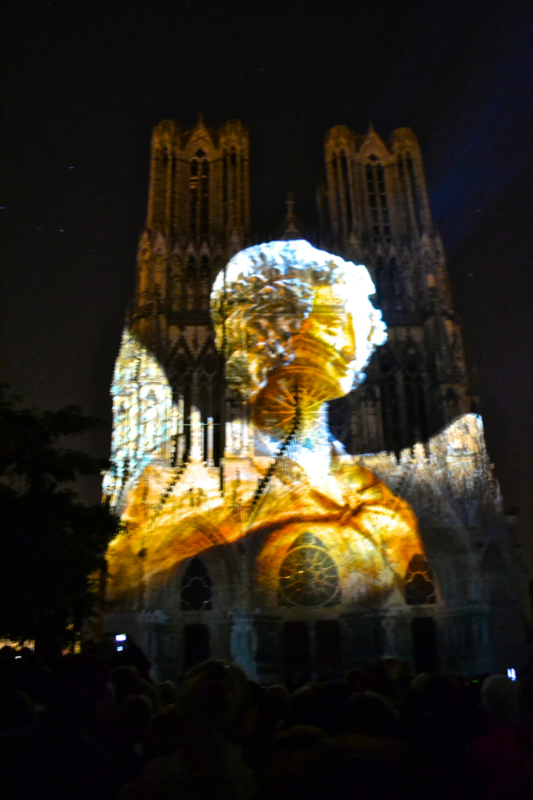 Here is the face of the smiling angel which has become an iconic symbol of the city of Reims. I also wanted to share with you a portion of the show that I recorded with my hand held camera, sans tripod, in the midst of a crowd of thousands. I thought my blog readers might like to see the sequence from drawing board to construction. Enjoy and please let me know if anyone else has seen this show or if I have inspired anyone to make travel plans.